Posted in Blog by ronnypot at December 1st, 2015. Thanks, helped me out a lot! Had the exact same issue. Many thanks for sharing this. I had doubts it could have been that simple but since I was at a loss figured it couldn’t hurt. Kudos and 2 thumbs up! I have been struggling with this for days now. I make a collection, the collection appears on the RD Web Access Work Resources next to the apps Calculator, Internet Explorer, Paint, and Word Pad. Clicking on the collection let’s me logon to the server desktop. But clicking on any of the apps leads to the same problem again ‘This computer won’t connect…’ . And the old Remote Desktop program under the start button doesn’t work anymore. Not to mention one of the ‘solutions’ I tried makes CTRL+Alt+Del non-functioning on the rds server (win 2012 r2). 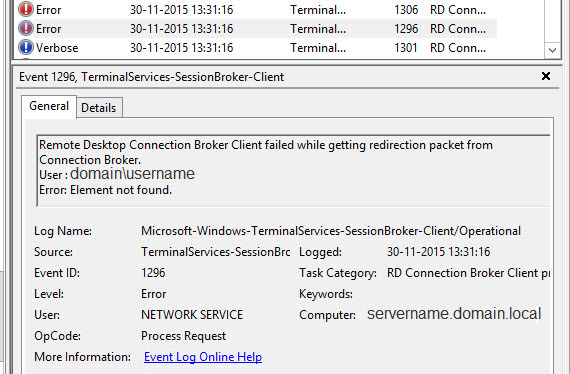 Also saw this after installing the broker on top of a working session host before creating a collection. Once the collection was created the issue resolved. Had a similar (same?) issue. Getting the 802 error in the terminal services gateway log, and users receiving “the remote desktop gateway server is temporarily unavailable”. I read somewhere before that changing a single published app regenerated all the configs and rdp files, and I had published calc.exe as a test for something a few weeks ago. I just unpublished it, and everything else regenerated and I was good to go. No need to recreate the whole collection. please can anyone help for deleting and creating of new collection..where to find these. I am having the exact same problem, however we are running a production environment with 100+ clients. Is there an alternative fix that does not require deleting a collection & re-adding? muchas gracias, tanks a lot, after deleting the collection the issue has fixed, regards. Thanks for the help! This worked right away! Help me as well. Thanks.